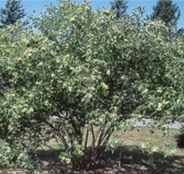 Deciduous member of the rue family , this shrub or small tree has trilobed leaves and fragrant greenish white blooms in spring, followed by thin wafer-like seeds. Tends toward multi-trunks, but can be trained as a single trunk species. Native North American species. Hardy to -40F (-40C); height: 25ft.